In the spirit of the freemasons, there exists a creative group called Levy 7. Not much is known - they describe themselves as, "a collection of like-minded individuals who, through their awesomeness and grace, elevate the larger group in any and every social and professional endeavor, making us simply the most dynamic advertising sleeper cell/social club in the free world." The materials were designed by our friends in DesignWorks at BBDO in New York, a group that bleeds pure design talent. There are business cards, coasters and of course, cigar bands. 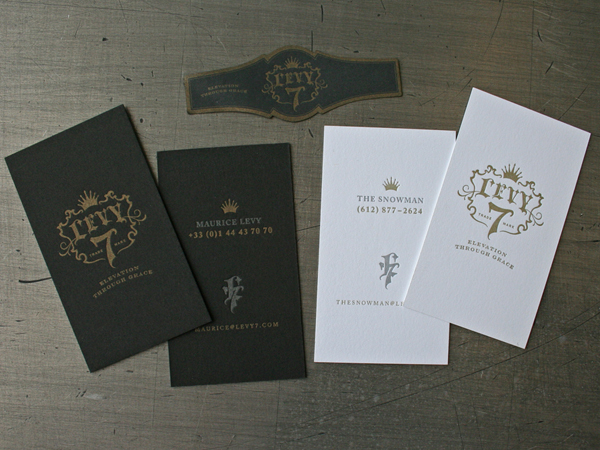 We letterpress printed the materials in two metallic ink colors. The black paper is ultra thick custom duplexed Black Stonehenge. The white is paper is 179lb Crane Cover, 100% cotton. The cigar band stock was a black text weight from French Paper. After the labels were printed, we applied a remoist glue to the back edge and die cut them. Now if you'll excuse me, I'm going to form my own letterpress sleeper cell fraternity.